Saturday marks three years to the day since dashcam footage depicting the shooting of Laquan McDonald was released to the public, showing Chicago police Officer Jason Van Dyke firing his weapon repeatedly as the black teenager fell to the pavement in the middle of South Pulaski Road. Van Dyke was charged with murder that same day and his trial this year laid out in great detail everything that played out before his October 2014 encounter with McDonald. But what about the moments, hours and days that followed? A Cook County judge will decide in the coming weeks whether three current and former Chicago police officers began working that same night to protect Van Dyke from prosecution. Prosecutors say the men conspired to cover up what really happened on the night of Oct. 20, 2014 – actions emblematic of an alleged “code of silence” within the police department to shield officers. As the unprecedented trial gets underway Tuesday morning, here are the key names to know. A former police officer, Joseph Walsh resigned in 2016 after nearly 20 years with the department following a report by the city inspector general that recommended he be fired. Walsh, 49, was partnered with Van Dyke on the night of the shooting for only the second time. 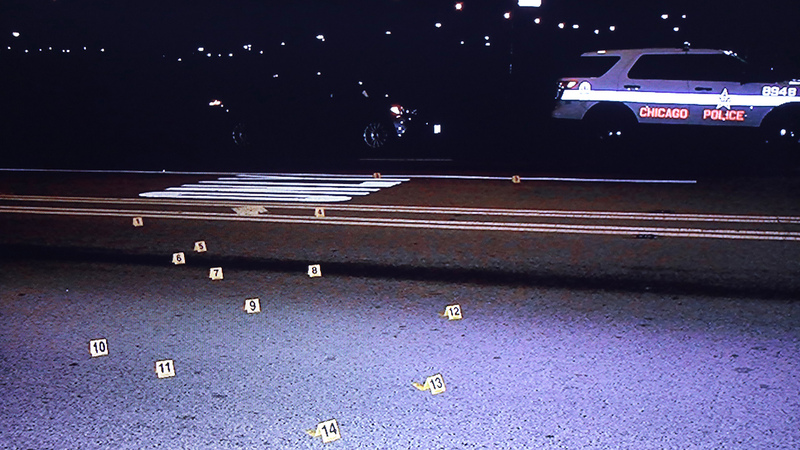 He drove their marked squad car to 40th Avenue and South Pulaski Road, and appeared on dashcam footage approaching McDonald with his gun drawn behind Van Dyke as the fatal shots were fired. In the CPD’s supplemental report from the shooting, Walsh claimed McDonald swung his knife “in an aggressive manner” when he got within 12-to-15 feet of the officers, and said Van Dyke continued firing once McDonald was on the ground because the teen was still armed and was trying to get back up. The dashcam video doesn’t show McDonald swinging the knife or trying to stand once he was shot. Walsh allegedly lied to investigators repeatedly in an interview about the McDonald shooting with the now-defunct Independent Police Review Authority. He also testified under immunity as a state witness at Van Dyke’s murder trial, claiming his partner “took necessary action” in shooting McDonald. He stuck to his story that the teen raised his knife before being shot and dismissed the dashcam video, saying it didn’t reflect his perspective on the scene. Walsh also told jurors that if Van Dyke hadn’t opened fire, he would have. A former detective who spent more than 30 years with the Chicago Police Department, David March, like Walsh, resigned following a city inspector general’s report that recommended he be fired. Chicago police Officer Dora Fontaine – who was on the scene the night of the shooting – is also expected to testify at trial that March included false information about Van Dyke being injured during his encounter with McDonald. A Chicago police officer of more than 20 years, Thomas Gaffney is currently suspended without pay by the department. Gaffney, 45, and his partner were the first officers to encounter McDonald on the night of the shooting following a 911 call from a civilian who believed the teen was breaking into trucks in a lot at 41st Street and Kildare Avenue. Gaffney remained inside his squad vehicle, but his partner pursued McDonald on foot for several blocks as the teen repeatedly displayed a knife in his hand. McDonald eventually stabbed at the squad car, damaging the windshield and popping a tire, before running off toward South Pulaski Road. Neither Gaffney nor his partner were injured, nor were they present on South Pulaski Road to witness Van Dyke shooting McDonald. Despite that, Gaffney stated in his report that three officers had been injured by the teen – himself, Walsh and Van Dyke – forcing the latter to open fire, according to prosecutors. Dashcam footage of the shooting shows this was not the case, as McDonald was shot and did not make any physical contact with officers. In previous testimony before a federal grand jury, Gaffney said McDonald “never came at us at any time,” adding he never personally felt threatened because he was protected inside his vehicle throughout the incident. Otherwise known as Jason Van Dyke, the Chicago police officer who shot McDonald 16 times. Referred to in charging documents only as “Officer Individual A” or “Individual A,” Van Dyke has already been convicted of second-degree murder and 16 counts of aggravated battery with a firearm stemming from McDonald’s death. He allegedly prepared a tactical response report that alleges McDonald battered and assaulted officers, and states he only fired his weapon “in fear of his life when the offender while armed with a knife continued to approach.” The report was completed and approved by two other unnamed, unindicted officers. Van Dyke is currently being held about three hours away from Chicago inside the Rock Island County Jail while he is awaiting sentencing. A Cook County associate judge since 2007, Stephenson is already the third judge assigned to this case. Judge Mary Margaret Brosnahan was first handed the case, but she recused herself. Prosecutors then successfully petitioned to have her replacement, Judge Diane Gordon Cannon, removed before the case was randomly assigned to Stephenson in July 2017. Stephenson has spent much of the last decade as a “floater,” according to the Chicago Tribune, meaning she would fill in for judicial colleagues who were on vacation or out sick. She got her own full-time courtroom just last year. Earlier this month, she denied defense motions seeking to bar witness testimony and toss out all charges against the three men. She has also granted a request allowing extended audio and video coverage of the trial. Each defendant has their own defense attorney. Veteran attorney James McKay is representing March. McKay is most well-known for his 30 years spent working as a Cook County assistant state’s attorney, where he led the prosecutions of William Balfour – who in 2012 was convicted of killing the mother, brother and nephew of singer Jennifer Hudson – as well as serial killers Andre Crawford and Andrew Urdiales. He left the state’s attorney’s office in 2015 and entered private practice the following year. McKay attended DePaul University and he received his law degree from Chicago-Kent College of Law. Thomas Breen and Todd Pugh, of the practice Breen & Pugh, are Walsh’s lead attorneys. Like McKay, Breen also began his legal career in the Cook County State’s Attorney Office, where he spent seven years before entering private practice in 1978. He has since led the high-profile exonerations of Gary Dotson – who was the nation’s first convict ever exonerated through DNA evidence – and Rolando Cruz, who had been falsely convicted in the 1983 murder of 10-year-old Jeanine Nicarico. Pugh also worked on Cruz’s exoneration and has extensive background in appeals and post-conviction cases. Finally, Will Fahy will represent Gaffney. He spent a decade as a Cook County prosecutor before entering private practice in 2001. He has previously represented several Chicago police officers who faced either criminal charges or dismissal from their job. Fahy also spent some time representing Van Dyke in the years before his murder trial. A managing partner in the Chicago office of Riley Safer Holmes & Cancila LLP, Patricia Brown Holmes was appointed as special prosecutor in July 2016 to investigate the aftermath of the McDonald shooting and to determine if any other officers should face criminal charges. Brown Holmes received both her undergraduate and law degrees from the University of Illinois at Urbana-Champaign and has served as president of the Chicago Bar Association. She was previously an assistant U.S. attorney, a partner at Schiff Hardin LLP and an associate judge in Cook County Circuit Court from 1997 until 2005.